A film version of JRR Tolkien's novel The Hobbit is to go ahead after its producers settled a legal row with the author's heirs. They sued New Line Cinema for a reported $220m (£133m) in compensation, based on breach of contract and fraud. 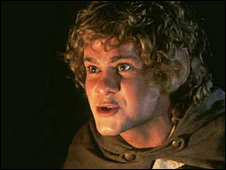 The suit claimed the US company failed to pay royalties due after the success of the Lord of the Rings trilogy. Its settlement, for an undisclosed sum, paves the way for director Guillermo del Toro's two films based on the book. New Line plans to release The Hobbit in 2011, followed by another movie drawing from other Tolkien works. Alan Horn, president of the studio's parent company Warner Bros Entertainment, said the firm was "pleased to have put this litigation behind us". "We all look forward to a mutually productive and beneficial relationship in the future," he added. Published in 1937, The Hobbit follows the treasure-seeking adventure of Bilbo Baggins who obtains the ring that was the focus for the Lord of the Rings. The trilogy's film adaptations, released between 2001 and 2003, made an estimated $6bn (£3.26bn) worldwide in ticket, DVDs and merchandise sales and won 16 Oscars. However, in February 2008, the trustees of Tolkien's estate filed the suit claiming New Line had paid it nothing other than an upfront fee of $62,500 (£32,000). They claimed historic film deals specified the estate was entitled to 7.5% of all profits made by any movies based on the former Oxford don's work. The Tolkien Trust, a British charity which supports causes across the world, will be one of the main beneficiaries of the legal settlement. Christopher Tolkien, the author's son, said: "The trustees regret that legal action was necessary but are glad that this dispute has been settled on satisfactory terms that will allow the Tolkien Trust properly to pursue its charitable objectives. "The trustees acknowledge that New Line may now proceed with its proposed films of The Hobbit."